I've earned a few more badges on 750 Words. 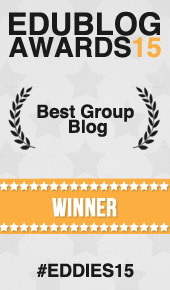 And yes, the badges are a a fun incentive to keep one motivated to write daily. 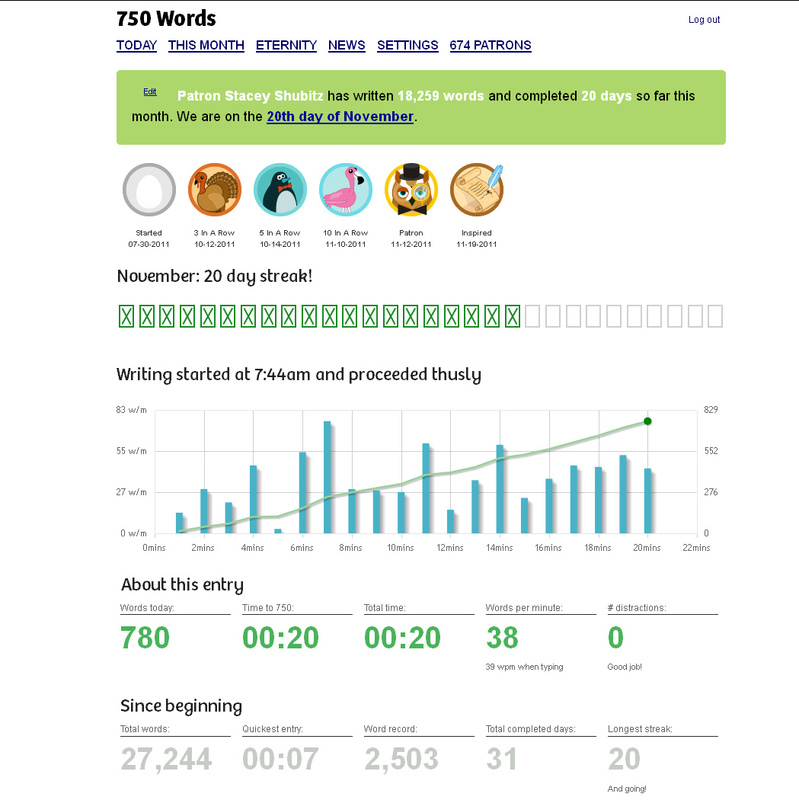 It’s day 20 and I’m still writing my 750 words daily! One of my fears, with taking on the 750 Words November Challenge, was that I would be unable to write while I was at NCTE. For $39 (gulp) one can get unlimited internet access in their hotel room at the Hilton Chicago. Talk about being robbed for wireless internet! I didn’t like paying that kind of money, but I knew if I were going to keep up with the Challenge, then it was something I had to do. I bit the bullet, paid the money, and have been able to keep up with the Challenge. One of the goals I set for myself this month was to do a lot of fiction writing. I have several ideas for picture books that have been rattling around in my head for quite some time and therefore I wanted to use the November Challenge to get them on the page. I’ve been doing this, but I haven’t been able to come up with a succinct draft during the past 20 days. My writing has been messy. And I suppose that’s okay, but there’s going to come a time, in the near future, that I’m going to need to tigthten-up my writing and get it into a draft. Yesterday, I talked with an editor from a publishing house I admire. I’ve known her for the past two years so I told her about one of my ideas for a picture book since I wanted to find out what she thought about the work I have been doing. She listened and then told me that it sounded more like a middle grade novel. In my head, I didn’t see it that way. Yes, my writing was going long, but I don’t t imagine the story I want to tell as a middle grade novel. I was up-front and told her that I didn’t envision it this way so she showed me two other books that dealt with sensitive subjects (which mine is) in a way that was accessible for children. Essentially, these books were shown to me as mentor texts. She told me that if I could present my story in this kind of way, as opposed to the way I had been writing it, that it would work as a picture book. As I looked through the books I completely understood what she meant. I was telling the story the wrong way. We talked a little more and I continued talking about the story I wanted to tell, but I began to tell it from a more kid-like perspective. When I finished talking she said to me, “Perhaps that’s the way you want to write the story.” YES! It was! Same story. Same message. Same characters. BUT, the way I framed the story was going to make it shorter and more accessible for children. I know what I need to work on now. I was lucky enough to bounce my ideas around with an editor I trust. I realize not everyone knows a children’s book editor and cannot do this. However, the conversation I had yesterday reminds me that it’s necessary to seek out people we trust, as we are writing, to help us work through the tough parts. Until yesterday, I felt as though I was trapped in a muddy pond, unable to wade through the water to get to land. Talking with someone about my writing allows me to better understand the work I’m doing and helps me get onto a path that will enable me to write in a way that will move me forward. ← Stories are essential to our lives. Neat post! I like that you got a chance to experience what students hopefully experience from conferencing about their writing! Wow! What perfect timing. I am glad that you had the opportunity to talk through your ideas. How exciting! At an author visit at our school, Linda Urban said that A Crooked Kind of Perfect started out as an idea for a picture book. She was SURE it was a picture book. She wrote it as a picture book. However, she kept getting the same feedback: this is a novel for kids. I am happy to hear you found a few mentors (both live and in print) to help you find the right voice for your story…but don’t be surprised if that story ends up becoming a longer book when all is said and done! This just implants more deeply the thought that talk is so important to the writing process. Look how you got a new perspective by hearing the thoughts of another. Too often I see teachers who consider writing to be a quiet time in their class. Kids need that time to explore their thinking with others. Congratulations on keeping up the 750 word challenge! I have loved the posts from the conference and look forward to future posts of your learning. Thanks for letting us live vicariously. It sounds like conference hotels have jumped onto the airline bandwagon of extra fees! I wonder if they’re all doing it? Your talk with the editor sounds so helpful, and I want to tell you that it was terrific you started the talk. Some might not have the courage to put the work/ideas out there, yet if we’re serious about the writing, we need to ask for feedback, don’t we? A lesson for many. It seems that you received a real gift from the convention, a path for your writing! Good for you that you were able to “see” another writing path. As a writer myself, I think we tend to get stuck, and only look at an idea the original way we conceived it. It takes a sensitive and gifted editor to figure out how that original idea can be best developed – how you can remain true to your own vision. Sounds like NCTE is proving to be a fantastic experience (although $39 for internet service seems a bit steep!). Thanks Tara! It’s so true about not looking at our own writing a different way. It’s almost like having blinders on. Thank goodness for other people’s perspectives! In terms of the $39, it was really tough to swallow. This hotel has nickel and dimed us all to death. $15/day to work out in the gym (which I didn’t do, but should’ve). $2.50 to check a suitcase. $20 to get a late check out. Very frustrating!